If you want to see pictures on your monitor at least a bit like what the author wanted you to see – you should have a calibrated monitor. I like for example my Dark skriker theme for this web but there are always a few people asking about the reason why I have completely unreadable website. Well, the problem is in their monitor adjustment. OK, the most important part is behind us and you can stop here. The gamma is a bit more problematic because the difference between CRT (you know, these old analog monitors) and new LCD displays is pretty big when you consider gamma curves. 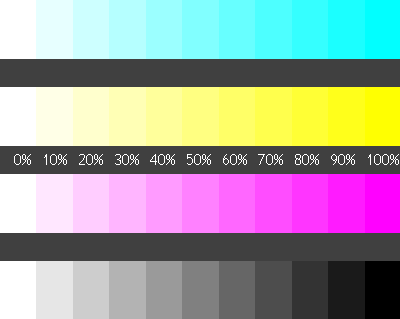 Anyway – you should be able to see the border between 90% and 100% at least on the last two stripes. Preferably the difference should be visible also on the first stripe. Don't care about the yellow stripe, that's another story. Note: gamma could be hidden under the "Color temperature" in your monitor settings where it could be possible to change the values for Red, Green and Blue separately. I’m wondering why I didn’t come up with a similar idea? I always listen to complains and I always have to explaine that the problem is the person’s screen. Thanks for the idea! btw you are running bilingual blog – do you know the Polyglot?